There was a time (maybe around 2 years ago?) when I was crazy about all sorts of differently wild shades of polish, from neons to pastels and glitter. Recently though, I've found myself leaning more towards neutrals, predominantly different shades of nudes and sometimes black. They're not as tiring too look at after a couple weeks and they go better with almost anything. But beige is beige...most popularly known as the most boring color in the world. :P It's pretty but safe and this is where NARS Galathee comes in. In my opinion, it makes a great alternative for something neutral. It's eye-catching and a lot more modern looking than beige but also goes as easily with most of my clothes. A pretty cool everyday polish. I used three coats because I wanted a really opaque look, if you want something more subtle, 2 will do. Just like all the other polishes by NARS, Galathee dries quickly and applies smoothly. It's also quite hardy as long as you let it dry properly. Since application, I already opened a coke can and performed other sorts of similar abuse but it still hasn't chipped off. 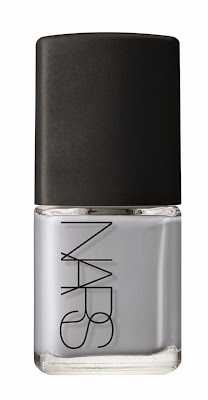 NARS Galathee Nail Polish retails for P995/bottle and is available at all Rustans Department Stores nationwide.